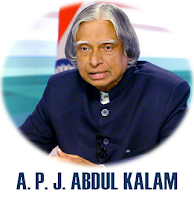 Dr A. P. J. Abdul Kalam death took place today, July 27, 2015 at Shilong, Meghalaya at 07:45pm due to massive heart attack. He was attending some conference there and while addressing to the students at IIM on Liavable Planet Earth, he felt unwell and taken to the army hospital immediately but unfortunately doctors couldn't do much as he has died on the way before arriving to the hospital. Though doctors admitted him in Intensive Care Unit but, couldn't revive his life. Dr David Sailo, MD, Bethany Hospital, Shilong said "he was brought to the hospital at 7pm without apulse or any other sign of life, and that effors were made to revive his life. 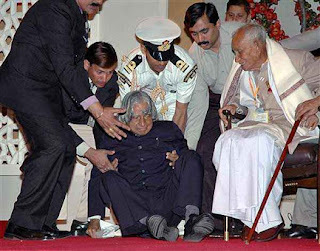 At 7:45pm Dr Kalam was declared dead. As for the cause of the death, dificult to say, but it may have been a cardiac event". He was 83. Avul Pakir Jainulabdeen Abdul Kalam was born in a boatman's family at Rameswaram town in Ramanathpuram district of Tamil Nadu on October 15, 1931. He has also distributed news paper at one time to support his family and his education. He is a perfect example of a poor become successful, top scientist, even President of India and Known as People's President. He was also known as the Missile Man of India for his contribution on developing nuclear missiles technology as head of DRDO, ISRO. He was the most beloved President of India (2002-07) for his nature, knowledge, his vision, dedication and great appearance. Our deep condolence and We heartily wish him Rest In Peace. - "If you want to shine like a sun, first burn like a sun"
- "Dreams is not what you see in sleep, is the thing which doesn't let you sleep"
- "You were born with wings/ Don't crawl.. learn to use them to fly and fly"